How should we conceive of social change and moral progress? How do they come about? How are the two phenomena related to each other and how can they be evaluated—as change for the better? These are questions which have repeatedly preoccupied contemporary philosophical discussion and which seem to be indispensable for a critical theory of society. The thesis is already implicit in the combination of the above-mentioned aspects: 1. Moral progress can be understood (assuming it can be understood) only in the context of a more comprehensive dynamic of social change; 2. Social change is, in turn, a reaction to crises, i.e., a reaction to the pressure of problems that necessitates change; and 3. Whether such change is merely a matter of alteration of circumstances or in fact constitutes "progress" (in the sense of a change for the better) can be seen only from the form assumed by this dynamic of change itself—although perhaps only through a negative diagnosis of phenomena of regression. Professor Jaeggi’s aim in this lecture will be to lay the groundwork for a non-teleological, pragmatist-materialistic, and in this sense, plural or multidimensional (hence, no longer ethnocentric), concept of progress. 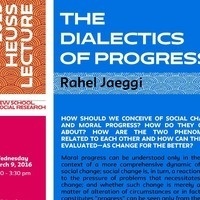 Rahel Jaeggi is the 2015-2016 Theodor Heuss Visiting Professor in Philosophy at the New School for Social Research. She is the Chair of the Practical and Social Philosophy department at Humboldt University in Berlin, where she has been a Professor since 2009. She received her MA at the Free University of Berlin and her PhD at the Goethe University in Frankfurt, where she taught from 1998-2009. Professor Jaeggi's recent publications include Alienation (Campus, Frankfurt, 2005/Columbia University Press, New York, 2013), Kritik von Lebensformen (Suhrkamp, Frankfurt, 2013/English translation forthcoming) and Nach Marx, co-edited with Daniel Loick (Suhrkamp, Frankfurt, 2013).